World premiere quartet for lujons by John Muphree, built by the composer. Additional works by Joseph M. Colombo and Robert Honstein and exhibitions by artists Eric Sealine and Dennis Svoronos. Join us for three world premieres by David Ibbett and BC composers, faculty Thomas Oboe Lee and senior Christopher Vu ’17, alongside music by Robert Honstein. Update: Thomas Oboe Lee’s work for marimba and voice is postponed due to illness. In its place, John Murphree‘s Jigsaw will be performed. Join us at the Peabody Essex Museum (Salem, MA) for the American exhibition premiere of Dutch artist Theo Jansen’s Strandbeests. These giant kinetic sculptures, or “beach animals”, will be shown off during PEM’s evening party series, PEM/PM, featuring a performance by yours truly. 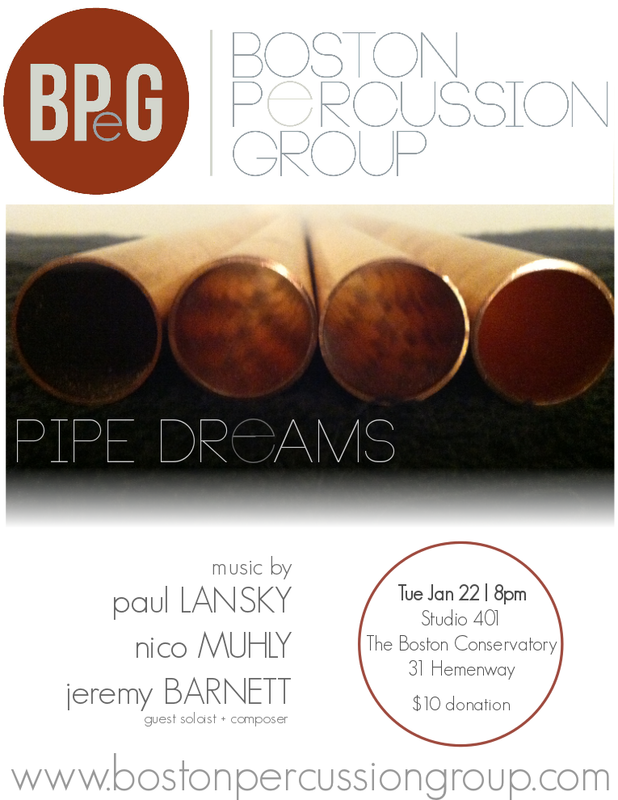 Come hear music for tuned pipes & pieces of wood including composers Steve Reich, Paul Lansky, and Boston’s own Aaron Trant. This all-marimba concert features classical piano repertoire adapted for marimba duo featuring BPeG’s “right-hand man”, Greg Simonds. Works by Bach, Beethoven, de Falla, Gershwin, Schumann, and more! Three premieres in the New Year! 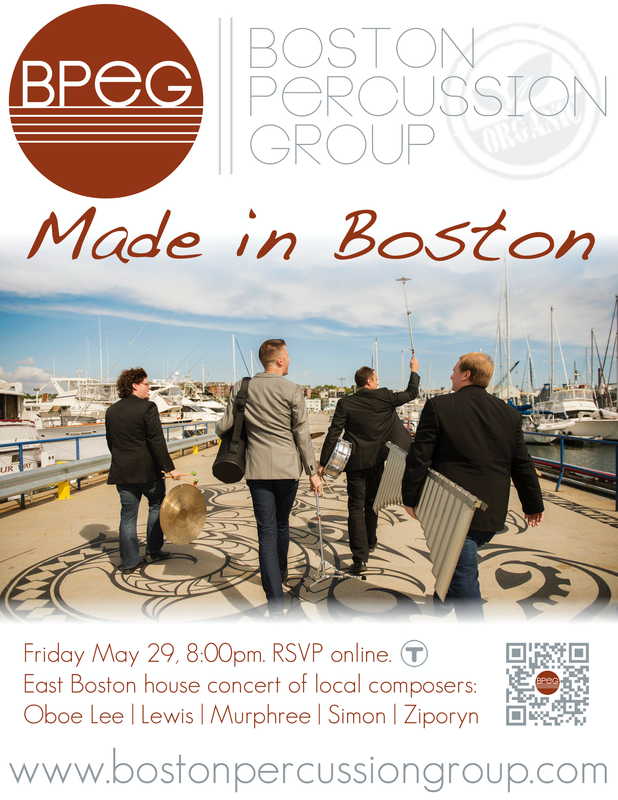 Made in Boston 2.0 returns to East Boston to highlight more local composers and three world premieres by Curtis Hughes, Beau Kenyon, and John Murphree. On the campus of Boston College, BPeG reprises BC faculty Thomas Oboe Lee’s Percussion Quartet along with the world premiere of Tour of the Vibrant City by BC composer and alumna, Alexa Canales. Additional works by John Cage, Curtis K. Hughes, John Murphree and Beau Kenyon to be performed. BPeG will present workshops and perform at the second annual Play On Music Festival. Joining forces with Boston’s leading women’s vocal ensemble, Lorelei Ensemble, MASQUED will explore the relationship between popular and classical music. This program will feature adaptations from Björk’s Biophelia album, and the world premiere of Radcliffe Institute fellow Reiko Yamada‘s Mask your sonic story for voices and percussion. Free outdoor performance at the Childe Hassam Park at 6pm! BPeG “shops local” using 100% locally grown and sustainably practiced music. This East Boston house concert features new works by Boston-based composers Thomas Oboe Lee, Daniel T. Lewis, and John Murphree. Private home of Jonathan Hess and Sonja Tengblad (address provided after RSVP). T-accessible: Maverick Station – Blue Line. Street parking. BPeG will be working with music students at Lynnfield High School and share the stage with them as part of our inaugural educational outreach program. On Monday, February 16, BPeG descends into the hip basement of Davis Square to play mixed chamber music featuring guest artists Lilit Hartunian, violin, and Lawren Hill, soprano. 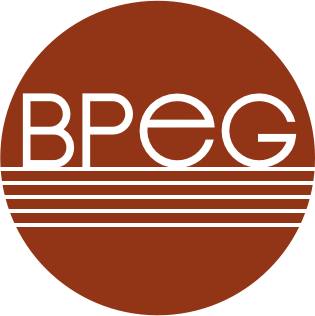 BPeG puts its spin on some familiar repertoire from the contemporary, classical and pop genres. Grab a drink at the bar and settle in to the sounds of marimba, strings, tabla, soprano, wood planks, and amplified, distorted speaking. We are honored to be a recipient of an Alumni Entrepreneurial Grant from The Boston Conservatory. We will performing and presenting on our project at the Welcome Weekend Alumni Concert in the brand new building at 132 Ipswich Street. Join us for our last pops show of the summer! 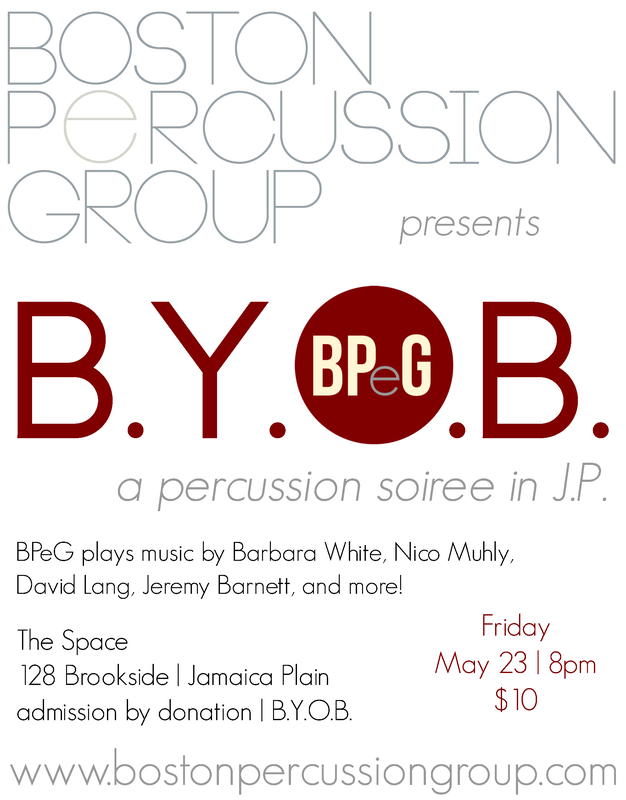 BPeG returns for this spontaneous music celebration in Jamaica Plain. A free, outdoor show next to the water at Magazine Beach Park! Showtime 6-8pm. 719 Memorial Drive: on the Charles River at the intersection of Memorial Drive and Magazine Street. There will be foodtrucks! BPeG joins musical forces across the city of Boston for the first ever summer solstice music celebration, Make Music Boston! This day is celebrated around the world with outdoor music performances on the longest day of the year, from 11am to 11pm. We will be playing fun, upbeat tunes outdoors at the Boathouse next to the Jamaica Pond. Grab a spot on a couch (and a beer) for a relaxed evening featuring music by Barbara White, David Lang, Nico Muhly, Frederic Rzewski, and more. 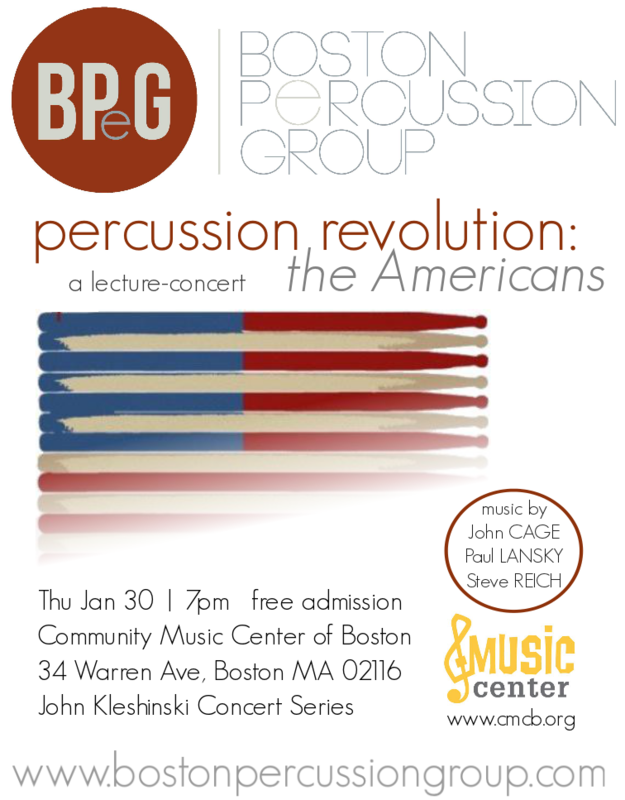 Joining us will be our featured guest and principal percussionist with Boston Modern Orchestra Project, Robert Schulz. The Space is conveniently located one block from the Orange Line – Green Street T station. Street parking is also available. BPeG member Jeremy Barnett’s final DMA recital at New England Conservatory features the premiere of his composition, “My Own Small Discoveries”, which he composed for BPeG. BPeG members give the premiere performance of Holy Cross faculty member Matt Jaskot‘s duo for mixed percussion, Away From It All. 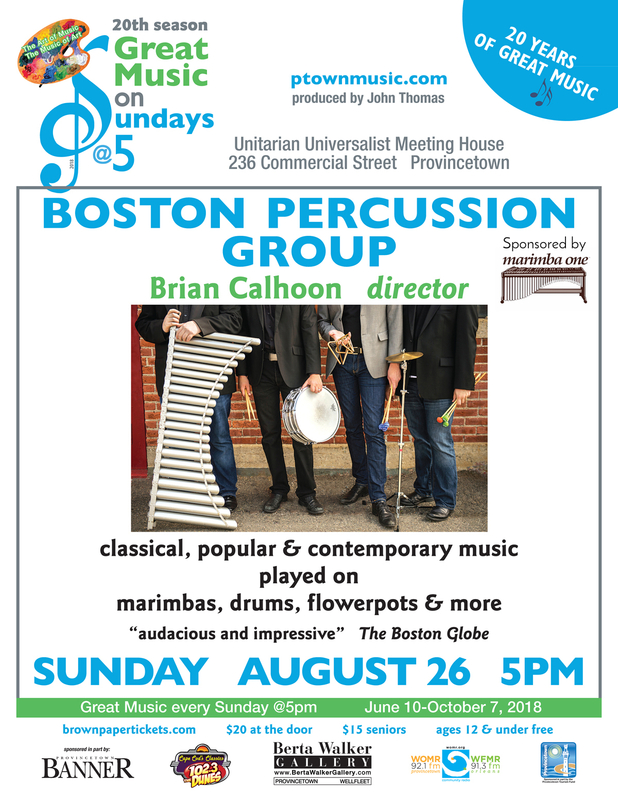 BPeG members join the international percussion trio, Ensemble Evolution, for a unique performance of a new piece inspired by photography of the Arnold Arboretum landscape in Jamaica Plain. Ensemble Evolution will perform their self-composed album Sounds from the Treetops as the Arboretum’s first ever Artist-in-Residence. More info here. BPeG was honored to perform for the ribbon-cutting ceremony to re-open Dedham Square at the Dedham Open Studios. The rain kept us under cover, but didn’t stop us from jammin’. BPeG is proud to join the third season of August Noise JP — a free, outdoor “surprise” concert series in Jamaica Plain. Stop by the Murphy Square Courts (across from Harvest Co-op) and be serenaded by drums, marimbas, buckets, and more. The grass along Huntington Ave becomes the BPeG stage during Circle The City’s event at the Outside The Box festival. Video clips below and a photo gallery on Facebook! 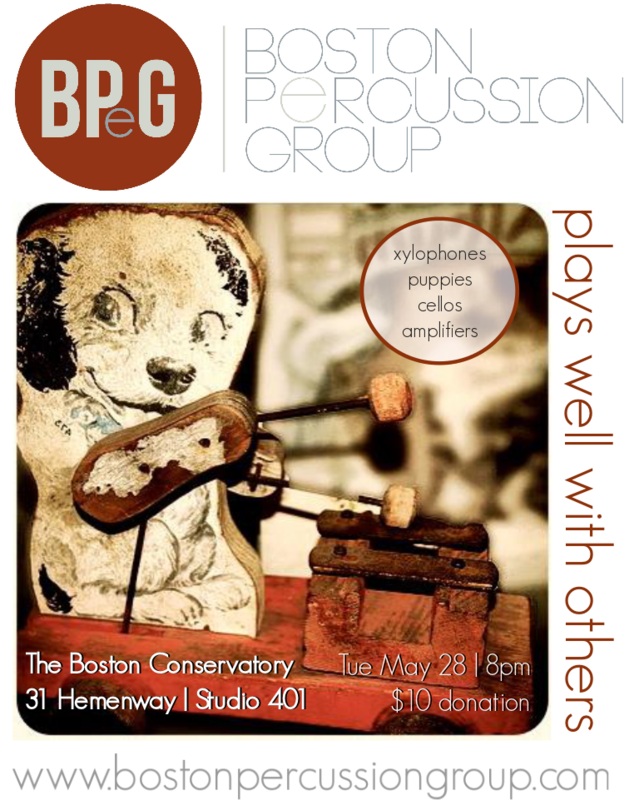 BPeG joins forces with talented Boston musicians in an evening of mixed chamber music. Program to include duos for marimba + cello, clarinet + multi-percussion, snare drum + live electronics, saxophone + marimba — and more! The evening will conclude with Tan Dun’s concerto for cello + percussion quartet, Elegy: Snow In June, featuring Christina Stripling. BPeG presented a class on the influence of rhythm on 20th century composers for faculty member Shirish Korde’s composition seminar. BPeG taught students at Roxbury Latin School about percussion as a melodic instrument before the students jammed on plastic buckets. BPeG plays music by Nico Muhly, Paul Lansky, and a reprise of a BPeG commission by composer/soloist, Jeremy Barnett. Including the premiere of “Dreams of Progress”, a BPeG commission by Jeremy Barnett featuring the composer as MalletKAT/vibraphone soloist with percussion quartet, performed by BPeG + friends. BPeG performed outdoors as part of the Emerald Necklace Conservancy’s Circle The City outdoor festival in Jamaica Plain. BPeG performed in Jordan Hall as one of seven finalists at the 2012 International Chamber Music Ensemble Competition. 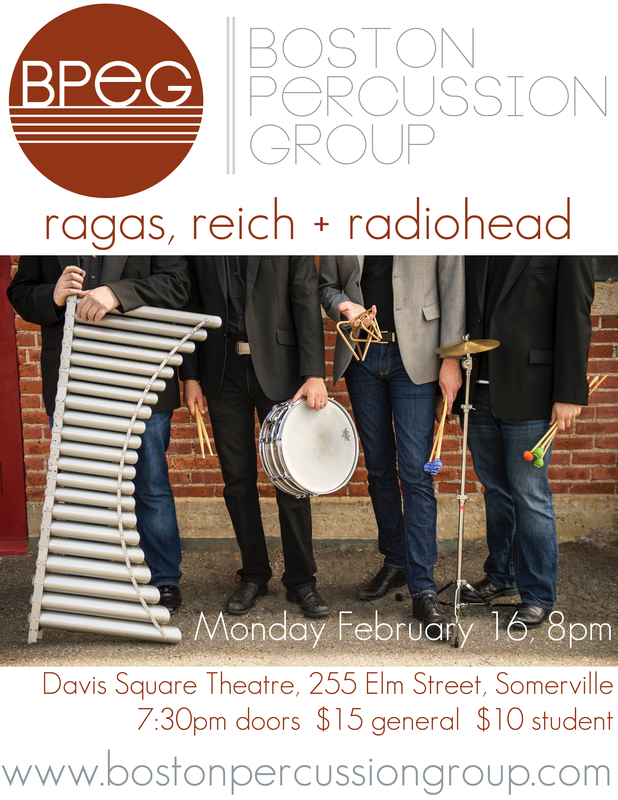 BPeG’s debut performance at The Boston Conservatory, featuring the Boston premiere of Steve Reich’s “Mallet Quartet”. BPeG performed at [ahts]: 2011 Boston Arts Festival. Video excerpt here.